Some of the best celestial objects are visible in the southern hemisphere, but are not visible from here. The wonders of the Southern Cross, the Magellanic Clouds, and the Eta Carinae Nebula are all permanently out of view, but the idea that the best southern wonders of the sky are never visible here is not totally true. Several beautiful southern open clusters in Puppis can be seen this time of year even though they are very low. A clear southern horizon and good weather are critical in observing them along with using the chart that follows. 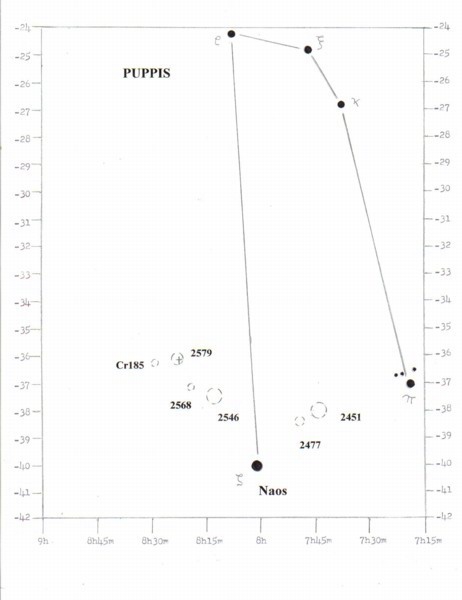 The brightest star in the target region is Zeta Puppis, also known as Naos, shining at magnitude +2.2. It is one of the hottest stars in the sky at about 75,000ºF and is around 60 times more massive and 800,000 times more luminous than the Sun. Naos rotates in five hours and is believed to be a supergiant burning helium for fuel. It will eventually explode as a supernova. One of the best open clusters in this region lies about 4º northwest of Zeta Puppis and is known as NGC2451. It is large and bright and readily seen with binoculars. Through a telescope a bright orange star shines in the center at magnitude +3.6. It is surrounded by a half dozen bluish-white stars and dozens of dimmer white ones. The cluster is spread out about 1º across. This author first observed NGC2451 in Aruba using a pair of 10 x 70 Orion binoculars and described it as “large, bright, loaded with stars, spacious, lone gold star”. Not far to the lower left is another bright open cluster, NGC2477. It is uniform in appearance with most of the stars of equal brightness. The concentration of stars increase towards the center making it appear more like a globular cluster and it is roundish. Further east is another large open cluster, NGC2546. It also consists of whitish stars of nearly uniform brightness and is oriented southeast to northwest. It shares the same region with three other open clusters that are all smaller, dimmer, and appear hazier. Collinder 185 (Cr185) displays around a dozen stars of magnitude +10 to +11 with no concentration towards the center. It appears oval and is easy to identify once it is found although not as obvious as its larger, brighter neighbors. NGC2568 is a small and faint open cluster that is best seen with larger telescopes and appears like a hazy wedge. NGC2579 is a curiosity as its location on a star chart actually reveals a tiny, faint nebula. At closer glance a loose, disorganized grouping of faint stars lies close to the southeast of the nebula and may in reality be a chance grouping rather than an actual physical open cluster. NGC2579 can most likely be considered a combination of a nebula and open cluster. Puppis is part of what was once a large and great constellation, Argo Navis or Argo, the ship that Jason sailed with the Argonauts in Greek mythology. It was broken up centuries ago into Puppis the Stern, Carina the Keel, and Vela the Sails. During this time of year it appears as though it is sinking like the Titanic with only its stern, Puppis, just poking above the southern horizon. These treasures are visible aboard ship for several weeks before the advancing season sinks it below the horizon for another year.